Be the first to rate this concept. 71 Followers Locked In To Be First To Purchase - Add Your Name To Join The VIP List, Limited Quantity! Sitting to watch a ball game or enjoying the sunny beach is great fun but the sun can have a major impact on your enjoyment if too hot or glaring. The Sun Shade concept is really not a new one but this particular concept integrates smoothly with the compact lightweight on the go mentality Chair-Pak customers have grown to appreciate. 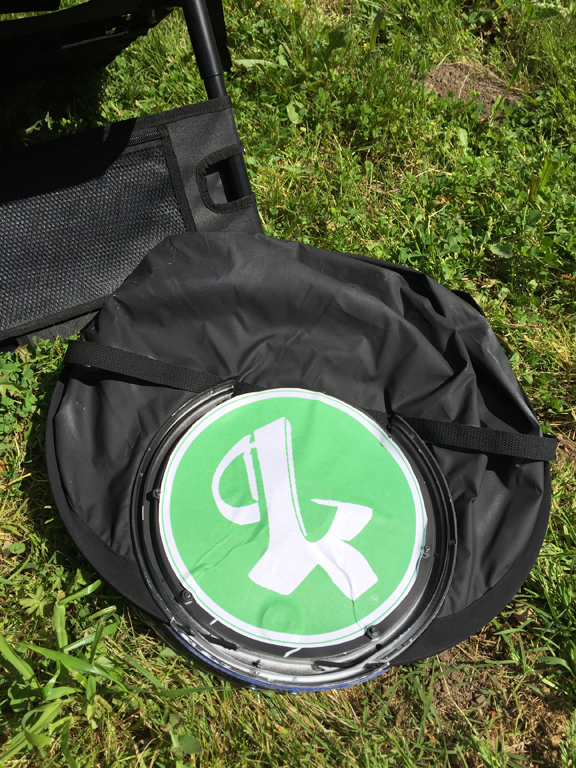 The operation is simple, take the 12” diameter Sun Shade out of your Chair-Pak, hold the base and shake it a little and the large 34” x 48” Sun Shade pops out instantly into a nice sturdy adjustable awning. Slip the base into the Shade slit pocket in the top of the backpack, sit and relax for hours. Easily keep the sun rays and even rain off your body as you enjoy the scenery and the game. To store simply hold the two long ends of the shade with both hands, twist opposite directions 180 degrees with your wrists and it collapses again to a 12” diameter circle to store in your Chair-Pak. Its that simple and effective. If you like this product addition to the Chair-Pak lineup, please take a moment and give us your feedback using the form below. When you vote this is valuable feedback to help us continue to invest our product development resources to ensure we are providing you the best product possible. Swivel the awning by 45 degrees in both left and right directions while sitting in Chair-Pak to follow the sun. If you would like to get a Chair-Pak TODAY no problem, it is great for anything outdoors FPV, camping, fishing, etc please visit Our Store & place your order. Thank you. 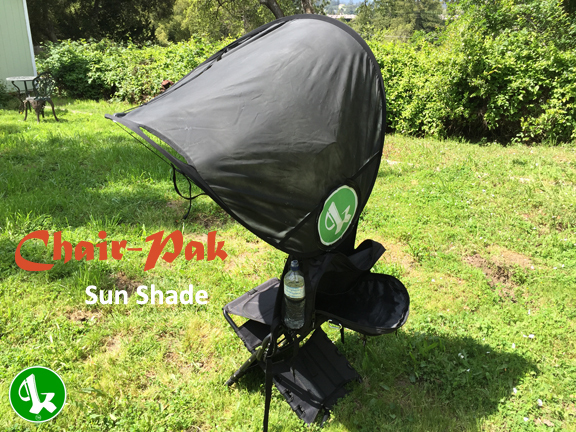 The Chair-Pak Sun Shade concept when we do hit our 50 follower goal and available, with your Sun Shade purchase will also receive our upgraded Chair-Pak backpack to replace today’s version for FREE. 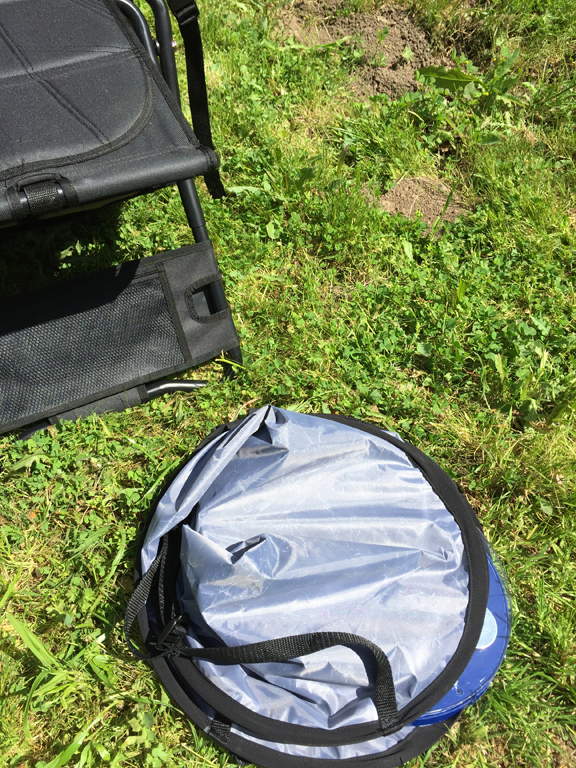 It will easily snap onto the backpack backrest frame and off you go and your new Chair-Pak Sun Shade will easily connect to the slit pocket on top of the new backpack provided. Just make sure you have submitted your email on this page. Any questions please send me an email at les@chairpak.com or submit a comment. Thank you again for your participation & business. Subscribe to this Chair-Pak add-on with your email below to get updates and to confirm you want to see this idea become a reality. We are looking for 50+ followers (emails) to move forward with this feature. Once we achieve this pinnacle we will finish the work needed to get it to you and on the market. You will be the first to know when the add-on is available for purchase. Thank you for your participation. It is sunny a lot in California. Where can I get the sun shade? That is a necessity here. Thanks! Most outdoor activities need some sun shade. This addition would be great!! Hopefully it will be out before the summer. This is a must have for me. Oh yeah, put me on the list. I will definitely buy this! Have you thought about pre-sales to help with production costs? We’ve used our new Chair-Paks at two music festivals so far and are happy with this product. Looking forward to the Sun Shade when it’s available. When will the shades be in stock? I wouild be interested in beating the heat. Count me in. Yes, I’d like a Sun Shade Add-on and upgrade!! This would be great addition especially at the beach!! Chair, backpack, drones and shade… oh my! Sign me up and take my money now!! 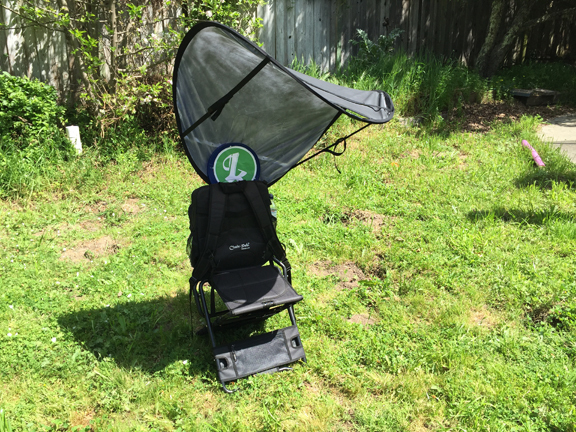 Chair Pak + FPV Pak + Sun Shade = TAKE MY MONEY!!! Awesome add-on! Will this be available in Camo? Would be great for hunting in light rain and bright sun. Gotta get one! This looks like an awesome add on. Can’t wait until this becomes an available reality. Sunshade combo looks awesome! Should we wait to purchase chair and sunshade together? Yep, as promised! Subscribing for this also. Looking forward to the backpack, solar charging station and sun shade! Would really like this and the quad pak/fpv pak x2.. Also wonder how well this cope with moderate wind like 5-7m/s. will the chair fall over or the shade just flex? What is the status of the sunshade and the quad insert for the chairpak? Hi Jan thanks for your vote. From production to stock for sale takes around 6 months after we receive 50+ votes. Yours is the 50th, YAY thanks, so we will get to work on it. Thanks again. Hi Penny, thanks for the interest. Chair-Pak is available currently at our store, as soon as we get 50+ votes on the sun shade add-on we will take the next steps on getting it in production. I would love to see this Add On for the Chair Pak! I live in Sunny Southern CA and it would be awesome for Airshows!! I’m interested! I live in the south and this will be a must! Great idea! I currently bring a 10 x 10 ez up canopy with me to rc field. Which is great when spending a long time there. For those days that im only there for a couple hours this would come in handy. Love it. Waiting on this and fpv pack to be in production. thanks for the vote and feedback Roy. Looking forward to adding this to my Chair-pack I received this summer! Come on, let’s make this one a reality! Excellent feedback John, much appreciated. This is again a great design and very useful in a country like Israel when ready for selling let me know I will buy one. Love this feature to combine with the FPV option – I currently carry a beach umbrella I got at Costco so I can do long range flying on the beach, and this shade would save some weight on the walk…. Great development! Will spread the word to get this over 50! Yes please tell your friends about Chair-Pak and add ons to help increase the numbers, we cant wait to supply the sun shade to you and all our customers. Thank you for your Chair-Pak purchase and vote John. Ill doubledip I want it!!!!! I am very interested in this add on, even I am from Australia, would love to buy one of this with the chair, since the postage for the chair is already USD 79, I am hoping to buy the sunshade and the chair together to save some postages. Thanks for the interest in Chair-Pak and the SunShade addon Alex. We will notify you when we get into production with it. Please let friends and family know so we can hit 50 followers. just ordered my chair-pak but am gonna need this as well……NEED for FPV races!!!!!! Went to see “Dead & Company” play at the Gorge amphitheater in George, WA. on Saturday. One of the requirements for bringing chairs into the amphitheaters grassy seating area was that the bottom of the seat could be no more then 9″ off the ground. Not a problem for the Chair-Pak with its’ adjustable seat strap! Now, if only we could get 17 more people to sign up for the sun shade. I REALLY could have used it. FYI, the show was unbelievable! I would definitely consider purchasing this add-on. Super awesome guys. FPV and dirtbiking camping you name it!!!! Man let me say this, Loving the chair for hiking and doing some FPV flying !! This product holds everything I need for FPV and I don’t have to drive all the time, Jump on the motorcycle and get to where I want to be with my Chairpak!! Can’t wait for the add ons!! Wow thanks for the great feedback Andrew we very much appreciate it. We are working hard to produce the first add-on the FPV Drone Pak for you all. Please keep providing reviews and let your fellow flyers know about us. Just ordered two of your chair-paks today, looking forward to the release of the sun shade! Will it also repel rain? Hi Ruth thank you very much for your Chair-Pak order today. We will let you know when/if the accessories become available. I need this for my chair!! Yes, Please lets get this in motion!! Hi Trevor thanks for the vote for Chair-Pak and the Sun Shade. Yes unfortunately international shipping is expensive and we do hope to offer product sales in the future in the UK and other countries. I live in the South and when you’re out in the sun all day having any kind of shade is a must. This would be a must have accessory. sounds like a great case for Chair-Pak and the sun shade DusDDustin. This is a great idea also, especially if the price point is good. Is it possible to order a prototype sun shade + chair pak today? I like the idea of the chair pak, but the sun shade is mandatory for me living and flying (FPV) in Texas. Hi Mike, unfortunately prototypes are not built to be used except for internal testing and to get a concept across, so we won't be able to accommodate your request, but thank you for the interest. Chair-Pak on the other hand is not a concept anymore and you may purchase yours today from our store and you can use any umbrella along with Chair-Pak to keep the sun off until the Sun Shade comes out. We will make sure you are notified when available. Please tell a friend, we will go to production once we hit 50 unique visitor votes. I like the idea a lot, more so when combined with the FPV pack. Could it be made waterproof? So in a pinch it could be rain shelter as well. Hi Alvin, yes the envision of the Sun Shade will be water proof to use during rain showers and help keep the user dry. Thank you for the comment. Excellent use for the Sun Shade and Chair-Pak Susan. Also I see you just placed an order for Chair-Pak, thank you for your business. Perfect for the beach and fishing. Please put me down for one. Good add-on for the FPV package. This would be awesome paired with the FPV Chair also! Prototypes work well together, we hope to make it a reality for you all. Thanks for the thumbs up Jason. Alright, please put me down for one of these. Since it’ll work in conjunction with the SolarPak, there’s just no way I could pass up buying one of these too if they became available. Thanks! Awesome Anthony thank you for all your support. That's 3 for 3 votes for all Chair-Pak add-on concepts. Sure do hope we can make this happen for everyone. 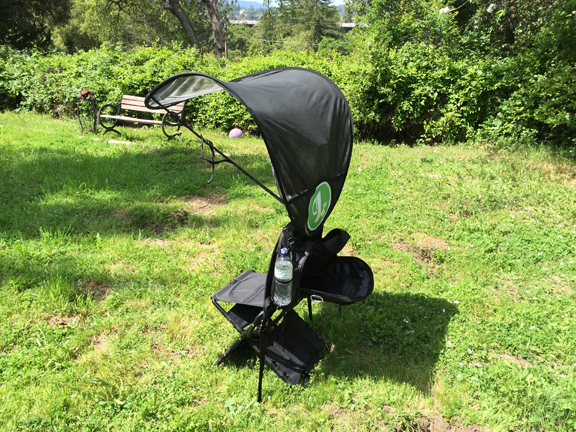 Fantastic idea…looking for a foldable chair with sunshade…Asia flyers will love this. Excellent feedback for our Chair-Pak Sun Shade Sean. Appreciate the vote. Thank you Cameron for the Sun Shade vote. This is a must have for the beach! Agreed Melissa, this add on makes perfect sense, thanks for the feedback. This would be a great addition to the Chair-Pak product line.